Drives well and is very reliable. Is a great car very reliable has lasted all these years was not driven very far for a number of years only to work and back and around the area I live in to the beach 200 miles a couple of times the car has had minor repairs only in all these years. Is really a good reliable model (accord) the interior has held up well and the outside also I have wash it very often so as to keep the paint from peeling the ride is comfortable. I have a silver colored accord which I like as I think this light color holds up well versus other brighter or darker colors on a car. The accord is rated I think as one of best cars in the industry. If it is not rated as one of the best it should be as it has been the best car I have ever owned. It is a really easy car to handle driving and parking as it is not the smallest nor is it too big in size. I think most women would like this model and the color. Honda is a reliable car to drive. It's a great gas saver. doesn't give me any mechanical issues. I drive around 40 miles a day, 4 times a week and is very reliable. As a full time student I don't have much money to spend on gas. I pump around 30 dollars a week in gas and that will be more than enough to get me through. It has never left me stranded. For being 18 years old it's still a car that I can depend on. The way it looks also is a plus because it doesn't seem like its an old car. And it sure doesn't drive like one either. I don't see this Honda as my permanent car. Though Honda is a very reliable brand. In the near future I will purchase a newer car. And it just might be another Honda. An older car that does not give me too much trouble. I think the car is great but it is now 18 years old so it constantly needs new parts in order to keep it running smoothly. It is an excellent size and has been easy to install car seats into both sides of the back seat. It is also very easy to drive since the large windows allow me to see my blind spot easily. As long as I keep us with basic repairs, the car runs smoothly. The engine is a little loud but it does not bother me too much. Also, I rarely have to spend a lot on labor time when a part is replaced because mechanics tell me that it is an easy car to do repairs on and the parts are very affordable. 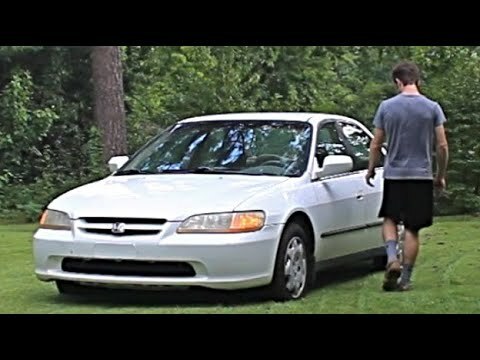 2000 Honda Accord LX: Working Class Hero. On certain passenger vehicles, the rear suspension lower arms and/or control arms could break due to improper welding. Vehicle handling and control would be reduced, increasing the risk of loss of control and a crash. Dealers will inspect and replace the rear suspension lower arms or control arms if necessary. The manufacturer has reported that owner notification began July 7, 2000. Owners who do not receive the free remedy within a reasonable time should contact Honda at 1-800-999-1009.